April 6, 2017 – Second day of the Russian Supreme Court hearing of the case brought by the Justice Ministry to ban Jehovah’s Witnesses in Russia. 14:30 The hearing began with the defendants’ application to suspend the hearing due to the fact that private complaints were filed yesterday against the court’s refusal to satisfy most of the 17 applications submitted. The hearing was suspended pending the outcome of these complaints. The Ministry of Justice objected to the suspension of the proceedings. The court retired to the deliberation room. The court rejected the application to suspend the hearing. 14:37 Omelchenko, a lawyer for the Jehovah’s Witnesses, applied for the inclusion of materials that may indicate that there are political motives for the persecution of Jehovah’s Witnesses. These include documents from foreign organizations such as the UN, OSCE, statements from Human Rights Organisations, as well as archival documents. The court granted the application for the admission of these materials. 14:40 The court reported the essence of the case and gave the floor to the Ministry of Justice. The Ministry of Justice representative, Svetlana Borisova proceeded to present arguments justifying the prohibition of all the organizations of Jehovah’s Witnesses in Russia. 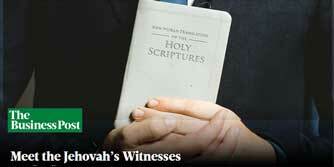 She listed court judgments delivered against the Local Religious Organizations (LRO) of Jehovah’s Witnesses. Concluding her speech, the Ministry of Justice representative asked the court to liquidate all Jehovah’s Witnesses organizations, remove their legal entities from the register and ban their activities. She asks that their property be confiscated and that the court to immediately execute the decision. Why is the Ministry of Justice seeking both to liquidate the legal entity and prohibit their activities? The judge was perplexed: If the legal entity is liquidated, then it does not exist; how can you ban that which does not exist? He asks whether the Ministry of Justice demands that all their unregistered groups be banned too. The Ministry of Justice representative explained that the Jehovah’s Witnesses have not provided any information about unregistered groups so she does not seek for such groups to be banned. On what basis has the Ministry of Justice applied a prejudicial approach to the Administrative Center of Jehovah’s Witnesses, if the center has not been involved in business? The prejudice is applicable in the case of decisions that have already entered into force (that is, the court relies on them as already established fact) only with respect to the same subjects of law. Accordingly, the decisions made by the courts in respect of the LROs cannot have a prejudicial effect on a centralized organization. 15:24 The judge asked if the Ministry of Justice had evidence of their allegations about medical treatment. The Ministry of Justice was not ready to provide them. The judge was puzzled, because the Ministry of Justice most recently conducted a large-scale inspection of Jehovah’s Witnesses and, if such facts were, they should have been identified. 15:25 The judge asked the Justice Ministry to clarify their statement that the activities of Jehovah’s Witnesses are a threat to public safety. The Ministry of Justice spoke of a threat to an unspecified group of persons. 15:30 The judge asked the Ministry of Justice representative if the activities of Jehovah’s Witnesses are prohibited, would the believers who gather for prayer be under threat of criminal prosecution. The Ministry of Justice said that they would if the court found them guilty of violating Article 282.2 of the Criminal Code of the Russian Federation: Organization of an extremist organization. Does the Ministry of Justice revise this list? The Ministry of Justice informed the court that the list can be revised at times. 15:39 The judge allowed the defendants an opportunity to question the Ministry of Justice. Zhenkov, another lawyer for the Jehovah’s Witnesses, first asked the court to refuse a copy of a court decision that the Ministry of Justice presented to the court a few moments previously. The court decision describes the case where certain parents brought a sick child to the hospital. The doctors diagnosed a low level of hemoglobin. They offered treatment that include medicines or the transfusion of blood. The parents went for the medicinal option but the hospital appealed to the court with a request for discretionary power to administer blood. The decision mentioned that there was no threat to life. It was a question of planned treatment. Zhenkov drew attention to the fact that there was no mention of Jehovah’s Witnesses in that court’s decision. If there is no mention of Jehovah’s Witnesses, what does this document have to do with the case? The judge postponed the determination of the document in question. 15:54 Zhenkov begun by asking questions of the Ministry of Justice representative. Does the Justice of Ministry have any information about any violations committed due to the influence of Jehovah’s Witnesses’ literature that was submitted to the list of extremist materials? Watchtower’s lawyers are unsure what is meant by human rights violations. Is the Ministry of Justice aware of the timely letters sent out by the Administrative Center to all LROs with regard to the inclusion of their materials in the Federal List of Extremist Materials? The Ministry of Justice knew. What, in the opinion of the Ministry, would be an effective measure? The Ministry of Justice representative does not know the exact answer to the question. Is there such a criterion of extremist activity as inaction? There is no such criterion. Do you know that materials that are considered extremist constitute 0.1% of the entire literature of Jehovah’s Witnesses? Zhenkov is including Jehovah’s Witnesses’ literature in other languages within his count. This is something the Ministry of Justice would be unaware of. It is known to the Ministry of Justice that the Rostov Regional Court, which recognized 34 publications of Jehovah’s Witnesses as extremist, refused to recognize dozens of others as extremist? Is it known to the Ministry of Justice that literature has not been imported into Russia for two years? Why in 2017 has the Ministry of Justice raised the issue of liquidation? The Ministry of Justice could not give evidence to support the claim that the Administrative Center had been spreading extremist literature in the last 12 months. The List of Extremist Materials does not specify when such materials made the list. Is it possible to file claims against the religious organization that imports materials into the country that may be recognized as extremist in the future? How is it possible to know in advance whether a particular material will be included in the list of extremist material? The Ministry of Justice representative stated that they only apply to the list of extremist materials. Toporov wondered whether the extremist law could be applied to the structural unit without being applied to the organization itself. The Ministry of Justice admitted that a warning must be issued to the entire organization. 16:42 The Ministry of Justice now believes that issuing a warning to the “structural unit” is not prohibited by law, which means that the prosecutor’s office could do it. What is not forbidden is allowed. Has there been at least some notice given to the religious organization (Administrative Center)? There was no evidence that any notification was sent. Does the law on combating extremism provide for the possibility of liquidating the “structural unit” without liquidating the organization itself? The Judge asked the plaintiff to accept the answer of the ministry in this form. Is there a department within the Ministry of Justice capable of answering when a particular book appears in the Federal List of Extremist Materials? The Ministry of Justice representative believes that the answer to this question can be obtained by judicial request. Why does the Ministry of Justice only support negative conclusions of experts but does not maintain a positive? The Ministry of Justice representative did not know. Does the Ministry of Justice initiated a review of decisions in cases where there was such a contradiction? 16:58 Omelchenko reminded the court that the Ministry of Justice was asked earlier in the day whether they had initiated a revision of the list of extremist material, after amendments were made to the law. For example, the Bible and quotations from it cannot be recognized as extremist materials. No such initiatives have been carried out by the Ministry of Justice. 17:07 Watchtower representative, Maxim Novakov next asked questions of the Ministry of Justice representative. Novakov tried to find out if the Ministry of Justice knew the circumstances surrounding the events that labelled Jehovah’s Witnesses’ activity as extremist. For example, did the Ministry of Justice know why the Special Forces cut of electricity in the area where their religious buildings were located when carrying out their searches. 17:13 The court announces a break in the hearing until Friday, April 7, 2017 at 10 a.m.